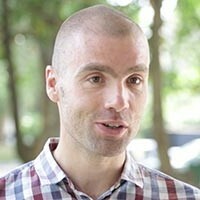 Marc Schut, a social scientist from the Netherlands, is based in Kigali, Rwanda. Marc obtained his PhD in Communication and Innovation Studies at Wageningen University, the Netherlands (2012). His PhD focused on better understanding drivers that influence the role of research on policy and innovation processes. Prior to his appointment with IITA, Marc worked as Postdoctoral Researcher in the PARASITE Programme with Wageningen University and Africa Rice Center. In his postdoctoral research, he developed and tested a diagnostic tool for Rapid Appraisal of Agricultural Innovation Systems (RAAIS), which was applied to analyze the institutional dimensions of parasitic weed problems in rainfed rice production systems in Tanzania and Benin. He also coordinated a project supporting the operationalization and implementation of a policy framework for sustainable biofuels in Mozambique (July 2011 to June 2012). Marc holds an MSc degree in Rural Development and Innovation from Wageningen University, and a BSc in Agricultural Education from Stoas Professional University, the Netherlands. Marc Schut is a senior scientist working with IITA and the Knowledge, Technology and Innovation group of Wageningen University (WUR). Marc is based in Rwanda, from where he leads innovation and scaling under the CGIAR Research Program on Roots, Tubers and Bananas. Marc is also Principal Investigator of the CIALCA project that focusses on systems research and development of banana, cassava and potato production systems in Central Africa, and of a BMZ-funded project that explores the use of digital innovation and ICT for banana disease control and prevention.